They have written that in 2019 they want to have it on Black Friday again. 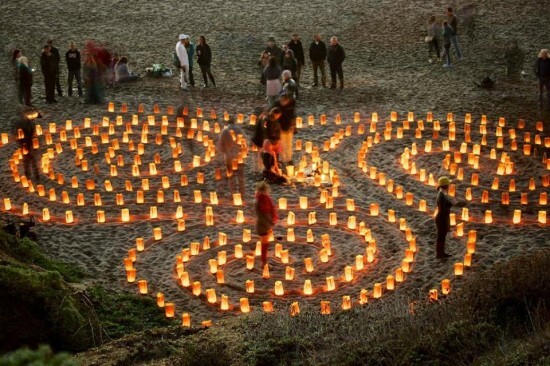 A local group of artists who call themselves the Museum of Joy will be celebrating the 6th Annual Festival of Light & Gratitude by building a temporary candlelit labyrinth on the northern half of Baker Beach where Burning Man began. 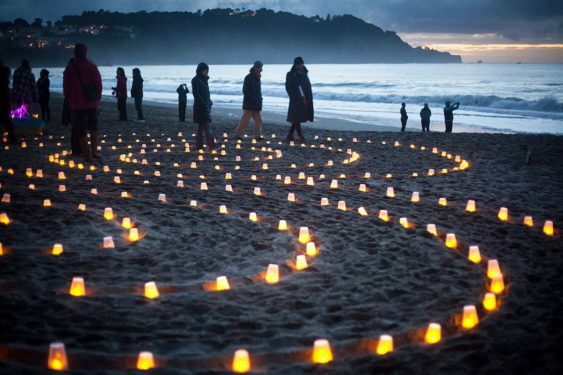 Gather with hundreds of others of like mind and heart for a twilight exploration of the labyrinth’s luminous spirals, reflecting on whatever matters to you: warmth, generosity, community, justice, wonder, gratitude, brightness, or whatever you choose to bring. Sundown is at 5:01 pm and it would be awesome if you arrived in time to share the sunset with the group. Why a labyrinth made of lights? Because winter is coming, dammit, whether metaphysically or actually, and if we all make some rough attempt to move with grace or thoughtfulness or gratitude or glee though a mystical symbol of the complexity of the universe all on fire with light and beauty, maybe the sun will come back to us one day. This is a family friendly event. Please set your intentions accordingly. They respectfully request that you move through the labyrinth in silence, and try not to yell with too much glee while near the space. Although this half of Baker Beach is clothing-optional, they have found that it can be extra-inspiring to come dressed or draped entirely in a color of your choosing that reflects your intention for your walk through the labyrinth. Please do be aware that there is a possibility that you will see (respectful and perfectly pleasant) naked people, especially if you arrive on the earlier side. Sundown, the official opening of the labyrinth, is at 4:53 pm. It would be lovely if you arrived in time to share the sunset and the opening of the labyrinth with the group, but, the labyrinth will be lit until 7 pm unless they are forced by park officials or truly foul weather to close it sooner. Please be aware that this is a simple art piece made by a few friends in the sand each year, not a large festival. There is no food, no performance, no vendors, and the bathrooms are far away at the other end of the beach; it’s just a beautiful walk at the end of a beautiful public beach. Usually only 200-300 people show up, and if there are significantly more people coming to walk the labyrinth this year, it is likely that folks may need to wait in line. Unfortunately we cannot make the labyrinth physically larger due to the constraints of the tide, so please be prepared to use your grace, patience, and good humor as you help us navigate a much larger turnout than usual. Driving: If you’re coming from the East Bay and generously willing to share your car with other festival-goers, please post in the comments how many spaces you have and where you’re leaving from. Muni: It’s slow going, but the 29 Sunset bus runs pretty much straight to the beach until almost midnight.